March 1, 2006 | HYRUM -- The dogs barked and pounced eagerly on the melting snow of the Hardware Ranch, waiting for their musher to release them onto the morning's track. 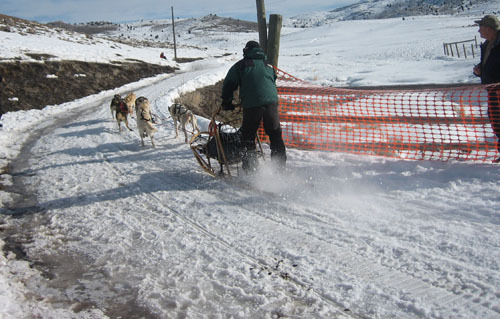 The Cache Valley Mushers Association held their second annual Cache Valley K9 Challenge in Blacksmith Fork Canyon Saturday and Sunday. A crowd of about 150 people gathered to watch mushers from Wyoming, Colorado, Oregon, California, Idaho and Utah lead their dogs around courses that ranged from four to 125 miles. The 10 dog teams attacked the 125 mile course that had a change of elevation of 1,500 feet and ran overnight. Temperatures dropped to negative 2 degrees and two sleds were lost to anti-freezing problems. The Cache Valley Sheriff's Office was on hand in the event of such problems, however, and no injuries were reported. Another division of six-dog teams tackled a 25 mile course as visitors cheered them from the starting line. One team was penalized when the overanxious dogs dragged their musher and sled from the line almost a minute early. Eric Gunnerson, trail boss for the event, said that he was very happy with how the race turned out. "We've still got some learning to do," Gunnerson said. "I want to sit down with the mushers and find ways to improve next year's challenge." A junior and novice class of 4-dog teams was held for mushers under 18. The teams ran a 4 mile course. "In my opinion the novice and junior races are the most exciting," Gunnerson said. "They leave and come back in just a couple of hours!" John Bunnerson was the winner of the 10 dog distance division. A prize of $500 was awarded.